Heat oil in a pan or kadhai and add mustard seeds and curry leaves. Fry the onions until they turn light brown. Now add sliced tomato and try to smash it. Add turmeric and red chilli powder. Add sliced spring onions and potato and mix it well. Add salt to taste. Add 1 cup water and cover it. Let it cook in medium heat for 10-15 mins. Sprinkle cumin powder (optional to add more taste). Serve it hot with chapati. 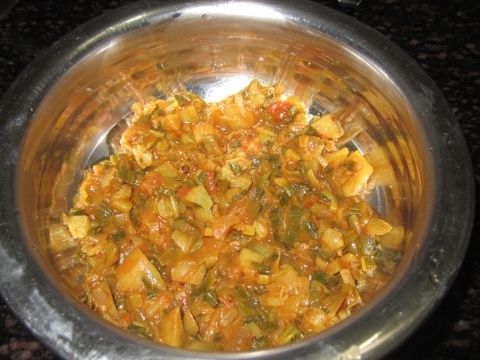 This Poriyal is very simple and yummy.